Wesley Wyndam-Price, perhaps more commonly known as The New Watcher, first appears in Bad Girls. The first time we see him, he's already begun to annoy Giles, by talking about the new methods of being a Watcher, and how it's more about fieldwork, etc. He tells Giles that he's faced two vampires, in controlled circumstances...It's kind of amusing to see him as sort of the anti-Giles, although the two Watchers do have things in common -- such as the way they clean their glasses with a cloth. Anyhoo, when Buffy first meets Wesley, she asks Giles twice if he's evil, and she refuses to shake his hand hello. Yeah, she's not too accepting, the loyalty thing, can't really blame her. Wesley's know-it-all attitude is kind of annoying, and besides that, it's doubtful that he'd give Buffy cookies after going on a mission. Snicker. We also learn that Wesley, while he wants to run the show, is somewhat cowardly in nature. When the Watchers are brought before Balthazar, he basically says that he'll tell Balthazar anything he wants to know, in order that his kneecaps might be spared. Jeez. Kinda makes you appreciate the whole "Giles is being tortured" storyline from Becoming part 2. I also have to say that I liked how Wesley had to go to the Bronze to find Buffy...partially because of the scene in Welcome to the Hellmouth when Buffy spotted Giles there after they first met at school. It would have been interesting to hear or see more of Wesley's reactions to Giles's fighting off The Eliminati, especially after Wesley has been kinda busting on Giles the whole time. Too funny. If we believe Wesley, then we know that he didn't get this job because of his looks...Buffy really, really believes that, herself. By the end of this episode, Buffy hasn't warmed up to him as new watcher guy. Neither has Faith, but, eh. In Consequences, Wesley sends the Slayers off to find out what they can about the murder of Allan Finch, since he's not yet clued in to the fact that the chicks are sort of responsible for said death. When he overhears Giles and Buffy talking about what really happened, that Faith is responsible for the death, he surreptitiously goes ahead and calls the Council. When he gets his backup, he storms into Angel's place -- where Faith is being held so that Angel might be able to help her with what she must be going through -- and has his guys knock Angel out so that they can "steal" Faith and take her back to England to stand before the Council. Not a bad idea, actually. Instead of being part of the camp that wants to try to rehabilitate Faith or whatever, here he's going yet again by the book, which seems like it's the right thing to do. Although if he had sent her there, the whole season would've been not exactly what the writers wanted, I'm guessing. I mean, no more new Slayer, no more new watcher? Anyhoo, Wesley has to let Faith go once she gets wild in the back of the truck that they're in. To keep her from killing folks in the truck, he unchains her. When Wesley reports to the gang in the library that Faith's escaped, he gets left out of the plans to go find her. Sadness. He must feel like really terrible. But I still want to know why no Watcher was ever sent for Faith. Why did they want Giles to keep being the Watcher for both Buffy and Faith? And then why would they take those duties away from him because of the whole Cruciamentum test thing (see Helpless)? I mean, come on. Not making lots of sense here. Oops, I'm doing this on the wrong page. Oh well. It's in this episode that Wesley meets Cordelia, whom he believes is a teacher at first. As she walks away after flirting with him, he calls her "cheeky." In Doppelgangland, Wesley's taking the Slayers out for their evaluations as ordered by the Watchers Council. He pretty much gets winded after taking Faith through the obstacle course/physical part of the test. He asks Giles if he wants to take Buffy through her run, but Giles says no. Heh. I don't think Wesley ever got the defibrillators he asked for. What I want to know is, don't Watchers have to be in good shape? Maybe he really did get the job on account of his looks. In Enemies, Wesley's trying yet again to show the gang who's boss during the Slayerette meeting. Cordy seems to have signed on back to the Slayerettes in an effort to get closer to the guy. Yee. At Oz's suggestion, Wesley takes the gang, minus Buffy and minus Xander, to scope out the town hall records about the Mayor. While there, a freaked-out and pissed-off Xander shows up and implies that the new partnership between Angelus and Faith is Wesley's fault, since he's supposed to be watching Faith, too, and he's obviously screwed up in that area. Wesley's kind of miffed when he finds out that he wasn't in on the Hooded Guy/Fake Angelus thing. Maybe a scone would make him feel better...? I still wonder if Wesley's going to bite it this season or just be sent back to England or perhaps go to the spinoff...But I'm not going to think about it that much. Earshot features a kind of amusing Wesley. 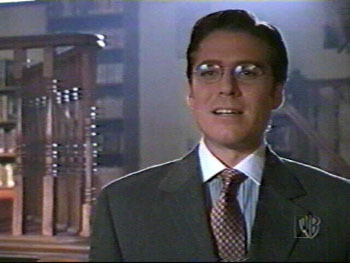 I mean, when he wanders into the library to see what Giles has been telling the gang, and finds out that Giles was filling them in on what he knows about The Ascension, he remarks, "..and what took up the rest of the minute?" Basically it's in this episode that Wesley's big crush thing on Cordelia is for sure revealed..not that we didn't already know about it. Wesley also points out to the gang that they'll most likely be thinking things that Buffy doesn't want them to know. What was interesting about this episode as far as Wesley is concerned, was seeing him at Buffy's house. He's the one who let Angel inside the house with the remedy for Buffy, and it made me wonder about how he and Joyce got along. Or just if they speak much or if this was his first time meeting Joyce. Huh. In Choices, Wesley is miffed when Buffy tries to assert her life as a person..and not just as the slayer. He kind of blows his top a little in this episode. When Buffy suggests that she's going to take the fight to the Mayor, Wesley is dubious. When the gang begins talking about their plan, he's sure they're going off half-cocked, and he's the one who reminds them that the Mayor probably put a supernatural whammy to ensure the Box of Gavrok's protection. Nevertheless, he finally ends up going along with the gang. He and Giles are to provide a distraction should any vamps come chasing after Buffy and Angel once they've stolen the box. Wesley's hysterical when he suggests that they all synchronize their watches, then sees that Buffy and Willow aren't wearing any. I have to wonder if he accepted Giles's offer of tea while they waited in the car. Wesley also has something to say after Willow's been captured by the Mayor and Faith. He says that while he'd like to save Willow, their main priority is destroying the Box of Gavrok in order to prevent the Mayor's ascension. This makes Xander ask for someone to hit Wesley, and prompts Buffy to ask if Wesley is even made of human parts. It also spurs Oz to toss over the pot that contains the spell goop. Graduation part I has Wesley trying yet again to give Buffy orders...too bad she's already come up with her plan first...I guess he's a few minutes behind her and Giles in the thinking game. Either way, he's big on her "reporting back" to him, and such. Okay, I'm tired now, so I'm stopping. Will continue shortly, and finish up season 3 for Wesley. Picture of Wesley courtesy of Sunnydale High School!